This week I got the same Tarot card two days in a row, which is usually a signal to pay extra attention. It was the 3 of discs, which in the Voyager deck I’m using currently is the 3 of worlds – nurturing. 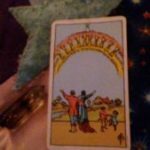 This deck often branches out from traditional Tarot definitions, and has its own delightful web of meanings and images. The first day I got the card, I sort of went along with their theme, and took in the information and wisdom of nurturing. I took it to mean not only self-nurturing, but also the careful balanced nurturing of a project. Like a garden – there is a certain amount of nurturing necessary, and then you just need to step back and let it grow. Or the nurturing energies of motherhood, as with the Empress card, which this card is connected to in this deck. When the card showed up again the next day, I searched my memory for the more familiar meanings of the 3 of discs. I’ve experienced it in the past as skills, ones that are being put to regular use. In other words, practice. I looked to the things I do as a spiritual practice, like writing and meditation, and the things I might not think of as a practice but are skills I use a lot, like cooking and doing dishes. Then it was time to connect the two. I got thinking about what nurturing and practice have in common. Hopefully, I am nurtured through my spiritual practices. Also, self-nurturing itself can be a wonderful spiritual practice. Sometimes, though, I can go through times when I’m doing my practices, but I’m still not being very kind to myself. I’m not feeling nurtured on a deep level. When this happens, one way to get back to feeling nurtured is to practice simply BEING. To slow down and notice the present moment. Over and over again. When that happens, my connection to my source grows stronger. And then my life, like a garden, receives the nurturing it needs to grow and thrive.